A judge has ruled that a further hearing should take place to determine if the Scottish Parliament's bid to oust independence campaigners from Holyrood is "proportionate". The parliament has taken legal action against the IndyCamp group, who set up camp at Holyrood in November 2015. Lord Turnbull said he could not grant an order against the camp until he was satisfied it was proportionate. He ordered a hearing to "identify the scope of further procedure". The camp was set up in late November by independence activists, who said they intended to stay in place until Scotland was declared independent. 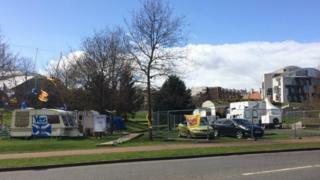 The Scottish Parliament took legal action to oust them, arguing that they were camping without permission, taking up space which could be used by others, and potentially risking the political neutrality of the parliamentary estate. In a lengthy legal argument in March, camp representatives put forward arguments for why they should stay based on the 1707 Treaty of Union and the Declaration of Arbroath. In his written judgement, Lord Turnbull said these arguments had "no legal foundation" but also said he did not consider that the camp posed a security risk or was "inhibiting" the use of the parliamentary estate by others. The judge said he could not find in favour of the parliament until he was satisfied that an eviction order was proportionate. He said: "The question of the proportionality of granting the order has been raised, in oral submissions at least, and in my judgement this is sufficient in the circumstances to bar me from granting the order sought until satisfied on this manner. "I will therefore refuse to grant the prayer of the petition...and I will make an order requiring the case to call at a procedural hearing in order to identify the scope of further procedure." He added: "The proportionality of granting the order sought by the petitioner is not something which has been closely focused on by the respondents to date. They no doubt directed their attentions to what seemed to them to be the grand or more interesting arguments, as influenced by their underlying political views. "In my opinion, none of these arguments had any validity." Lord Turnbull went on to say that he anticipated a hearing would be fixed where the parliament and the camp could present witnesses and evidence to support their respective cases. A Scottish Parliament spokesman said: "We welcome Lord Turnbull's opinion today which recognises that the protesters camp constitutes trespass and an encroachment on parliament land, and that the parliament may seek an order for the removal of a trespasser who refuses to leave. "Today's opinion provides a positive step forward in the resolution of the issue and we are happy to comply with Lord Turnbull's request for information on the sole remaining issue of proportionality."